I liked the model of the PD we most often saw in TOS, where the spirit of the law was that we shouldn't be telling other cultures that they have to be like ours. Not so much the model we saw sometimes in TNG, where the letter of the law was followed to the extent that we were, as he says, willing to watch whole civilisations die when we could have helped. Take "Homeward", the one with Worf's brother. Yes, there was disruption to their culture. Yes, one of their people died. They might turn out to be miserable on their new planet, maybe. Is that really so much worse than every last one of them being killed? And there really are fuzzy grey areas between those two things that could be fun to explore. I would love to have seen an Ent episode where Humans ended up on this kind of slippery slope. Say they find a civilisation that's suffering from a global disaster - asteroid impact or something. So they send doctors for the sick and injured, and engineers to help rebuild. But law and order have broken down, so then it's security personnel to keep order. But they come to be seen as resented invaders by some, so there's terrorism... and so they send MACOs... and on, and on, until it's essentially the worst aspects of the post-Iraq-war environment. Do one episode per season on the planet, maybe a mention here or there in other episodes, showing things there gradually inexorably falling apart until it's worse than it ever would have been if they'd just left them alone to rebuild themselves. But noooo, we got the temporal cold war of pointlessness instead. Yay us. Just to play devil's advocate; how do you have the spirit of the law without the letter of the law? You don't. You have the letter, but follow the spirit. It's called "legislative intent". Courts - and in this case, Captains - are expected to take account of what the legislature intended a law to do, as well as what it actually says to do. There have been cases where a court decided that the literal meaning of the law could be ignored in favour of the obvious intent of the legislature. I see non reason why a court - or a Captain - couldn't make a similar judgment and say that the PD obviously wasn't intended to make Starfleet sit by and let an entire civilisation die before their eyes when they could stop it with the push of a button. All very well (or not - see below,) but the fact is that there is nothing - no spirit, no intent, not interpretation - without the letter of the law being in place first. Further, once that is in place, personal interpretation (which is a more accurate term for the attempted divination of legislative intent) is necessarily limited by that letter. As to the merits of in situ authoritative interpretation of legislative intent... well, unfortunately, such interpretation is always left to people. Fallible, personally prejudiced, molded-by-experience, agenda-having people. The line between being flexible enough to allow for adaptation to any situation and being thin enough to be used or discarded by anyone so inclined is finer than most people think, and must be tempered by a commitment to a particular standard - the standard being what is set down, i.e., the letter of the law. This letter must not be unalterable, but if it is shown to have a defect the solution must be to fix the law, not the allowance to ignore it by individuals. Mikey wrote: All very well (or not - see below,) but the fact is that there is nothing - no spirit, no intent, not interpretation - without the letter of the law being in place first. Hence my saying you have the letter, but follow the spirit. Further, once that is in place, personal interpretation (which is a more accurate term for the attempted divination of legislative intent) is necessarily limited by that letter. I have no problem with this. I'm not suggesting everyone should just do whatever they like all the time; only that there should be flexibility there for the more egregious cases where following the letter of the law would result in wrongs. Picard even invokes this specifically in "Justice" - citing what the Prime Directive was not intended for as a reason for breaking it. Though to my mind this is an example where he did so wrongly, at least given what's been said about the PD previously. A CNET author seriously asked "iPod, the music thing?" Anyway on the prime directive. At first I thought it was ridiculous. Later I came to appreciate it as ridiculous in world, but that it made sense for the writers. It let them have these very relateable espisodes in TOS and TNG that wouldn't have been possible if they just rolled in with heavy orbital bombardment to solve all their problems. It also let the writers create some moral tension and discussion into episodes. Actually, Prime Directive episodes are probably the hardest to predict the outcome of. 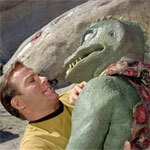 And without the temporal prime directive, what wouldn't every episode be like a bad Voyager episode? However I've come to actually appreciate the principle in world, especially as I view more of human nature. When it comes to cultures, gratitude is short lived, and of little or no practical value even while present. And don't be surprised to find any effort to help twisted around into some diabolical imperialist plot by some demagogue. However if a culture feels wronged they may remember that for thousands of years. And messing with the internal politics of some other government are not well received, possibly even by the group you're trying to help. Also if you do something nice for someone, everyone else starts getting angry if they don't get the same treatment. My kids ruin a lot that way. There are so many civilizations with so many needs in the Trek setting they'd never do anything except be interstellar social workers if they tried to take care of everybody, this lets them stay above the fray.